If you want to hang an item that supports weight, like a decorative shelf or television, then you need to locate and use at least one wall stud for support. Studs support the drywall running along all the walls of your house and ceiling. They are wood or metal 2x4s running from floor to ceiling in the wall and perpendicular to the roof peak in the ceiling, typically spaced 16 inches apart. Before you being searching for your first stud, it's important to note that, though commonly used, the term 2x4 is not an accurate description of their thickness and width. They are only 1 ½ inches thick by 3 ½ inches wide, with the smaller side facing you. Keep this in mind when preparing to drill, screw, or nail into your stud. If you are unsure whether you have wood or metal studs, climb into your attic. Usually the type of stud framing your roof represents the majority within your house. Visually locating that first stud at the standard 16 inch interval is difficult because spackle, orange peel and paint usually hide the blemishes construction leaves behind. 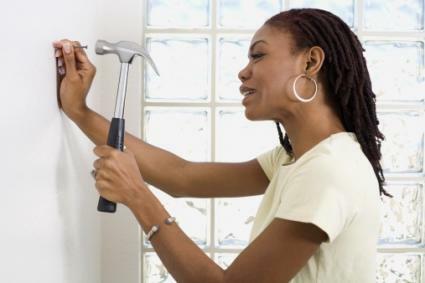 The following clues on your walls themselves will help you find those studs without scratching your paint. All the above boxes are nailed to the side of a stud. Simply use a screwdriver to remove the cover and see which side the box is nailed to. There's your first standard width stud. The two best methods of locating the exact middle of the stud you need for your project, and minimizing search holes in your drywall, are the digital and measure methods. A digital stud finder makes finding a stud easy. Measure the distance of the closest outlet box from the adjoining wall. Measure the same distance at height of project location. Mark lightly with pencil. 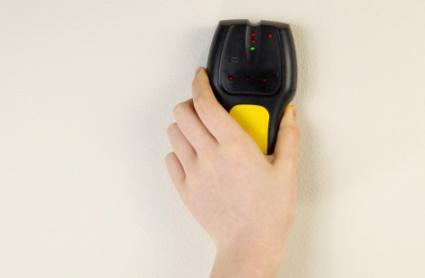 Use the stud finder to confirm location of stud in wall and the operation of finder. If the finder fails to find the stud, replace the batteries and try again. Starting at the known stud, move towards the desired placement of project. Lightly mark with pencil when the wall stud closest to placement is reached. Use a hammer to tap the nail through the drywall into the stud to confirm presence. Remove nail and erase all pencil marks from wall. The remaining hole now marks and starts the screw placement for project. This method relies heavily on the home builder's use of a standard 16-inch stud placement. Builders differ on procedures, so a simple tap test with a wrapped hammer will ensure the location before you make a pilot hole with your nail. Measure outlet distance, stud side, from closest adjoining wall. Measure and mark every 16 inches from known stud until the desired placement is reached. Wrap hammer in rag and tap areas to left and right of mark to confirm the area is not hollow. It sounds similar to knocking on the sides of a closed empty cardboard box. Areas close to corners sound less hollow. Unwrap the hammer and tap nail through drywall into stud to confirm. Remove nail and erase all pencil marks. Make the remaining nail hole marks and starts for screw placement for project. Metal and wood stud materials create some issues so be aware of the hidden problem and solution for each type. Wood: Knots in wood can put more stress on screwing. The solution is to drill small holes for more precise screw alignment and minimal drywall damage. Metal: The thin metal walls of the stud can bounce when hammering. This bends nails and can cause injury. Combat this by pre-drilling holes and using self-tapping metal screws. This prevents "walking" of the screw and excessive drywall damage. Some closets and small storage areas may not have any studs lining the walls. The studs will only be in each corner of these areas, which can be a problem when hanging shelves, and drywall anchors can only support so much weight before the wall gives out. This is the likely scenario if you can't find a stud, so use attachments that support the load from the front.